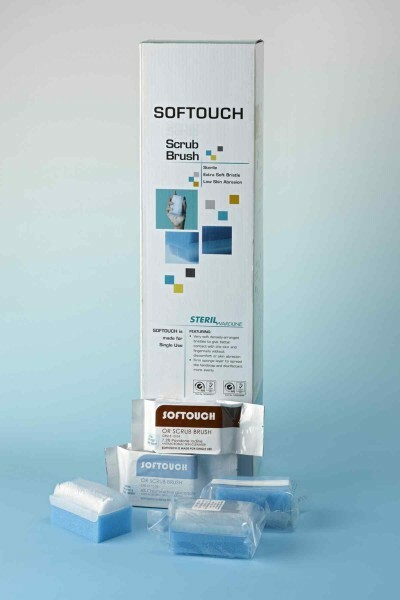 SOFTOUCH Disposable Scrub Brushes are designed for operating room nurses and surgeons who continually have to scrub their hands and arms as part of the aseptic procedure that precedes every surgical operation. The brushes are designed to have bristles that do not cause discomfort or dermabrasion when repeatedly used. A sponge piece backing allows the device to fit comfortably into the palm of the user. The sponge is also used for spreading the disinfectant hand soap over the hands, forearms and lower arms. STERIL Scrub Brush PLAIN is supplied sterile in a pouch with a central strike paper to allow the sterilization gas to enter the pouch and sterilze the brush. 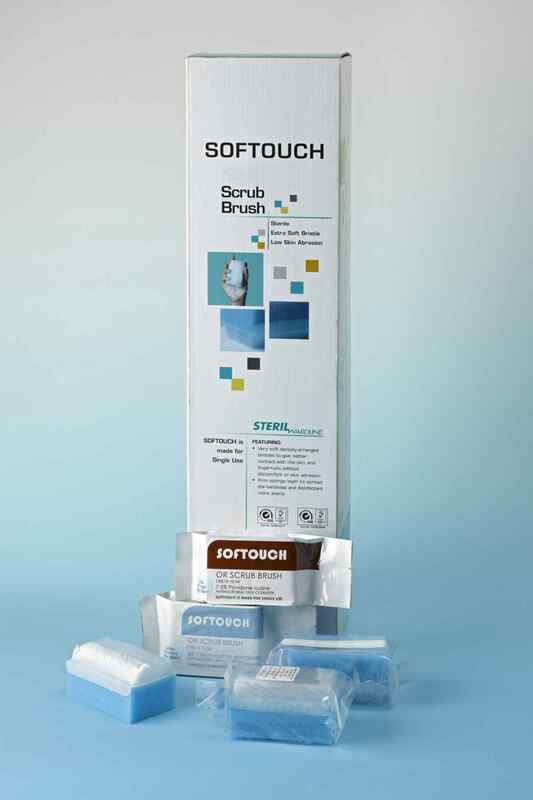 SOFTOUCH Scrub Brush PVP-I is supplied sterile with a sponge that is impregnated with a hand soap that contains 7.5% Povidone Iodine. SOFTOUCH Scrub Brush CHG is supplied sterile with a sponge that is impregnated with a hand soap that contains 4% Chlorhexidine Gluconate. SOFTOUCH Steril Scrub Brushes are tested and validated for sterility and disinfectant efficacy following sterilization. Following gamma sterilization, the question arises as to whether the providone iodine and chlorhexidine disinfectants undergo chemical changes that alter their structural and antimicrobial properties. STERIL not only validates the device sterility but also the chemical integrity and antimicrobial potency of both disinfectants following the dose (KyG) of irradiation used. STERIL Scrub Brushes are provided in a dispenser that can be placed in a stainless steel holder that can be mounted conveniently on any wall.